Geela's Lifelong Passion In Action! 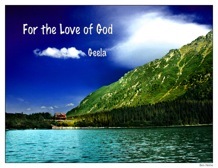 The song For the Love of God is a divinely inspired song containing a powerful and timely message of hope and unity written and performed by award-winning singer-songwriter-activist Geela Parish. Coming from a region which has never known peace, the epicenter of senseless violence, the volatile Middle East provided the inspiration for the song. The song was featured as a charity CD for Operation Healing for the World & Giving with the Stars national awareness campaign, which was launched by Geela Parish as part of her advocacy efforts to advance the cause of nonviolence and peace. The song was recorded by such music icons as Patti La Belle and has been generating tremendous rave reviews. “I would like to thank Geela, both individually and collectively on behalf of the NBA, the Los Angeles Lakers and Clippers for her time, great performance and contribution towards making the National “Stay in School Awareness Day” for making the school assemblies organized by the NBA, a tremendous success. I also loved her inspiring music. Continued success and best wishes." It’s time for our hearts to beat as one. A flickering light will shine so bright. World for you and I.